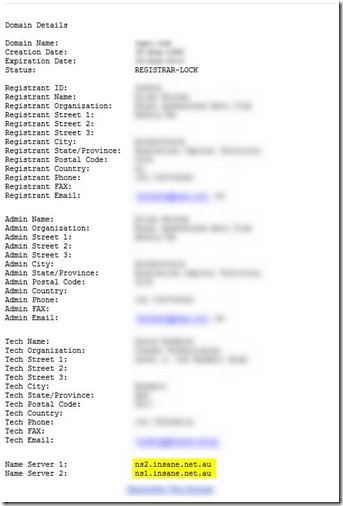 Finding out who the registrar of a domain name is and which company is hosting the DNS and website. This article will assist you in finding out who to contact if you require any information regarding your domain name and also a good place to start if you need to find out who is hosting your DNS or website. A simple Whois lookup on a domain name will help you find out whom to contact if you need to find out some of the information that would be required to transfer a domain name to a different registrar and make any changes to your DNS or hosting information. 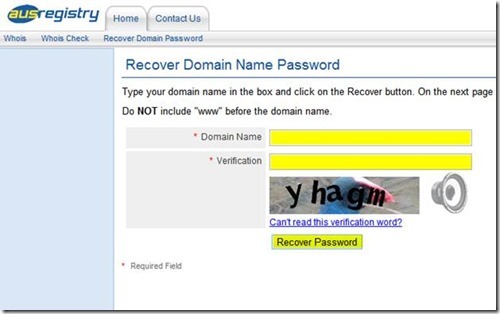 o Recover the Domain Password (Auth Code). o The Name servers of where the domain name is pointing. This is normally where the website is being hosted. 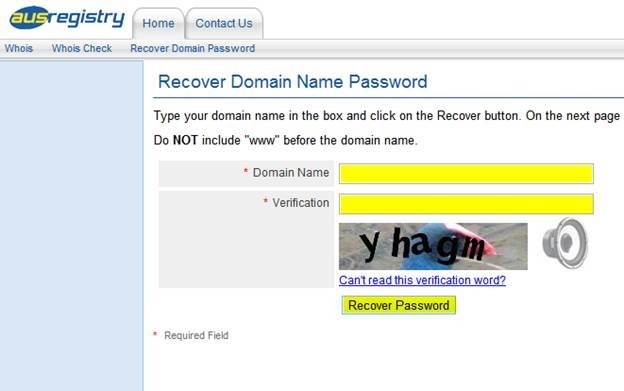 · To recover the domain password click on the Recover Domain Password link in the top right hand corner. · Type the domain you wish to recover the and the verification. Then press Recover Password. The password will then be sent to the Registrant Contact Email. NOTE: ensure that you have access to this email address before you request the password. If you don’t have access to the email account you will need to contact the Registrar and request for the password to be changed. You will need access to this email account again once we begin the Domain name transfer process. 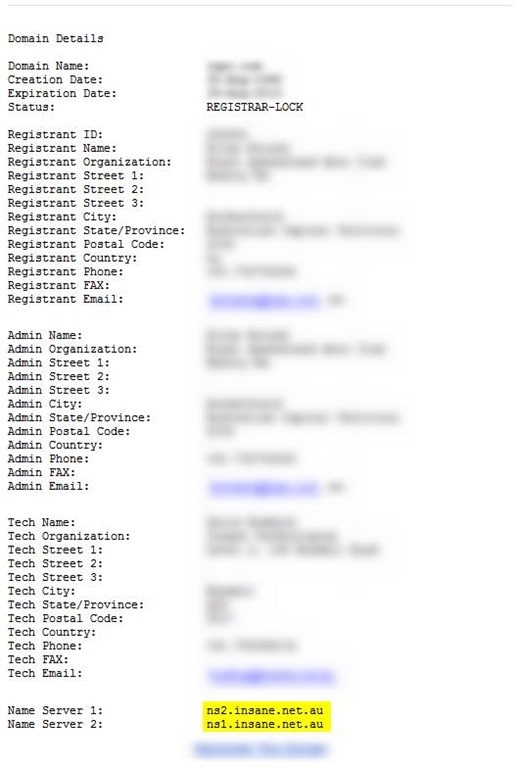 If you click on the link next to the Registrar Name you will be transferred to the companies website. · The Name Server information at the bottom of the Query page usually will be able to help you with who is hosting the website (sometimes there may be DNS redirects an there for the name server information may not be where the site is hosted). In this example the domain name is pointing to ns2.insane.net.au and ns4.insane.net.au so the company that is hosting the website is www.insane.net.au. If you need any Hosting Details a good place to start is by contacting is company. · The Name Server information at the bottom of the Query page usually will be able to help you with who is hosting the website (sometimes there might be a DNS redirect and therefore the name server information may not be where the site is hosted). In the above example the domain name is pointing to ns2.insane.net.au and ns1.insane.net.au so the company that is hosting the website is www.insane.net.au. If you need any Hosting Details a good place to start is by contacting this company.